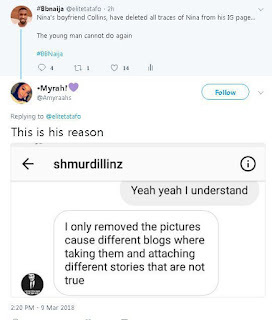 Owojela’s Blog learnt that Big Brother Naija housemate Nina’s boyfriend Collins has deleted pictures of her on his Instagram page and put his account on private. 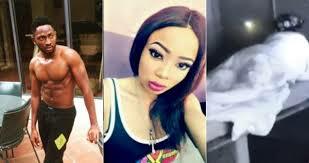 Nina, is currently in a hot romantic albeit on-screen relationship with her fellow housemate, Miracle and it was safe to assume that Collins grew tired of seeing all that (although he had previously been very supportive). However, in a twist, it seems Collins may not be done with her due to a little conversation which was revealed via twitter. A twitter user with the handle @elitetatafo tweeted; Nina’s boyfriend Collins, have deleted all traces of Nina from his IG page…The young man cannot do again.. So the question now is, are they still together, we can only wait till Nina’s time in the house comes to an end to be able to answer that.